Do you suffer from imposter syndrome or feel like a fraud? Do you hold yourself back out of lack of confidence? Do you feel you're not smart enough, talented enough or experienced enough? It's time to stop playing it small so you can reach your potential and make more money in your business! Check out the first blog post in this series about 7 setbacks holding you back in your business! Let me start you off with a pep talk! You are smarter than you know and more talented than you realize! There will always be someone who has less knowledge than you, less experience than you, or who does things different than you. Figure out what your zone of genius is and what unique experience you have to offer, then let that guide your work. You can start small to gain the confidence you need to step into bigger and better things. Once you're ready to step up, find a mentor or someone you could hire to back you up and cover you if you end up not being able to handle the task yourself. Once you start stepping out of your comfort zone, it'll be easier and easier to put yourself out there. Sure, you won't win every deal or land every opportunity, but you have to try! Remember, you miss 100% of the shots you never take. Don't get stuck in the "research" phase! If you find that you're always trying to read one more book, listen to one more podcast, or watch one more webinar before moving forward, I challenge you to give yourself a deadline for your learning. While business growth and knowledge is extremely important, if you're constantly learning and never taking action, you will never reach your potential. By setting a limit to how much time you spend learning, you'll be able to move forward much faster. Sometimes, too much learning can also pull you away from your zone of genius. You never know whether something is actually working for the person you're trying to learn from, or what their strategy is behind their tactics, so make sure you're not swayed by others. Looking at too many sources can water down your message. 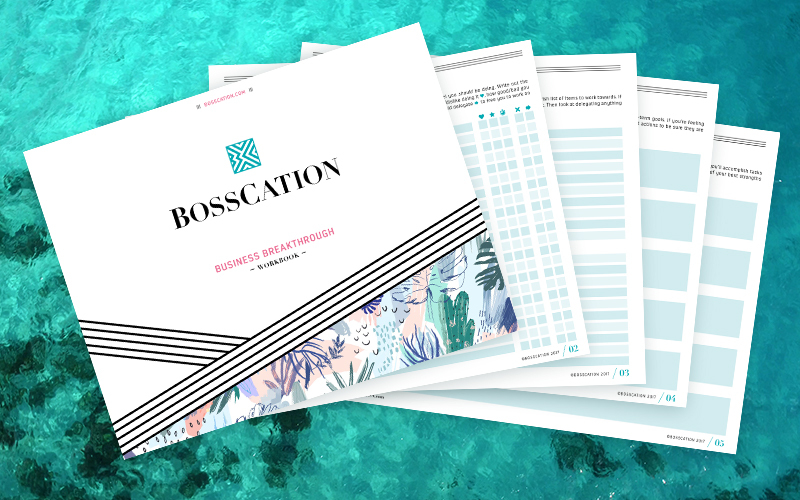 When working on the niche section for the Bosscation "Launch Your Signature Offer" strategy guide, I found myself looking at a ton of different resources to build the pages. But when I went through that section for myself, I realized that it wasn't very helpful. I then recreated the section based off my own strategy, and it's one of my clients' favorite sections now! Often, we struggle from imposter syndrome because we're caught up playing the comparison game. We all know who wins and loses in that game... we lose and everyone else wins. The problem is, that's so wrong! We have no idea whether someone is actually as amazing as their social media makes them out to be, what goes into their success, or how long they took to get there. You can't move forward if you're busy looking sideways! You must follow your own path to develop confidence. If you have to, "unfollow" those who you've been jealous and discouraged by, so you're not tempted to compare yourself to them any longer! For more on how to break free from imposter syndrome, make sure to watch my latest YouTube video!